Adina and Steph came to our house for weekend. Today was Adina's birthday and she wanted Bouillabaisse so we made it. 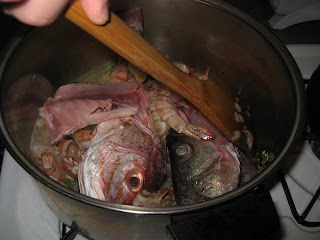 Look at the tasty fishheads. I made this cake for Heather's birthday. 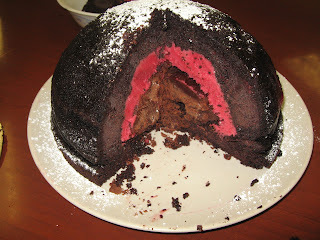 Chocolate cake with raspberry sorbet center and chocolate ganache in the very center. The ganache was too hard though ... oops. 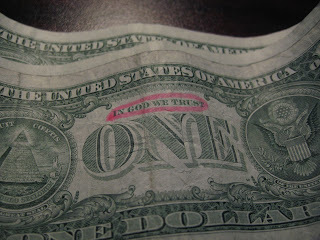 Apparently someone was studying this dollar bill and decided that they wanted to remember the "In God We Trust" phrase, because they highlighted it in pink. 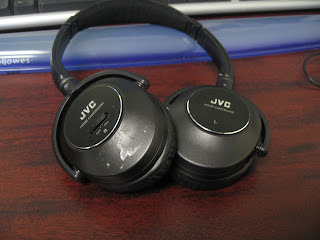 I ordered myself these noise-cancelling headphones so I can enjoy my flight to Tokyo better. They are awesome but there was a label on them so it's still sticky. 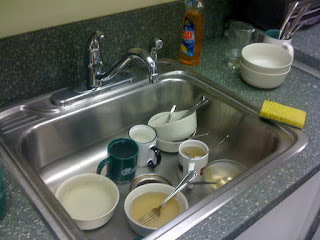 Look at how messy this sink is! This is in our common area at work. I don't understand why people don't put them in the dishwashers that we have! 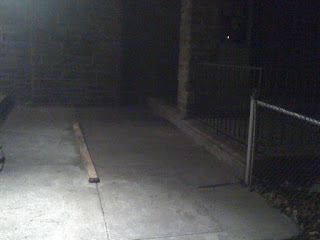 We came home tonight to find that the workers next door had poured a new cement driveway in the back and had fixed part of the walkway in the front. Nice. 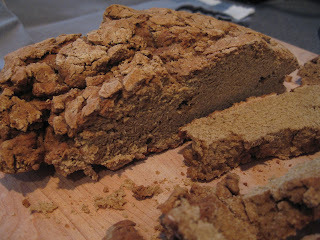 I read about this gluten-free version of the No Knead Bread recipe and wanted to try it for Deb. I made it today with absolutely no success. It was completely disgusting. We went downtown today to do some errands. 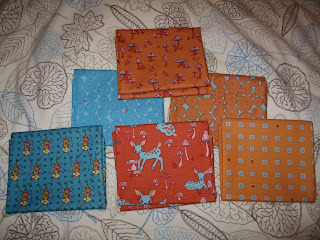 We stopped in at Loop and Spool and I got these awesome fabrics at Spool. They are designed by Jay Mccarroll. 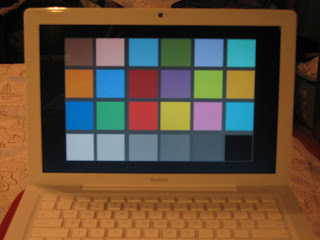 I use this program called CHDK to allow my camera to take photos in the RAW format, but I need someone to convert the colors for me! So I took this photo to help. 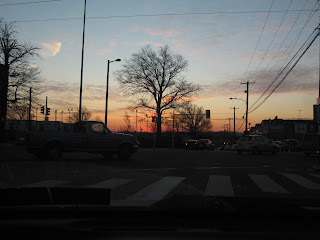 This is one of my favorite spots on the way to work because in the winter, I get to see the sunrise pretty often and this tree looks awesome in front of it. I have gotten absolutely SICK of driving into Drexel for class. So today I drove to Fern Rock and took Septa. If I do this every week, I'll save about $5 each week. 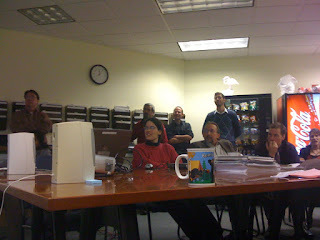 We organized a viewing party at the office today so we could all see Obama's inauguration. Partway through, we had to set up a radio because the video was choppy. 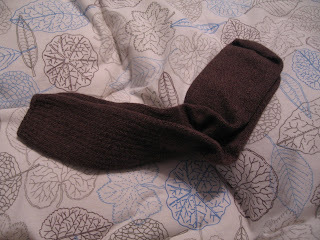 My parents gave me great new socks for Christmas and here are some of them. I don't remember them yet though so Chad had to remind me that they were mine! 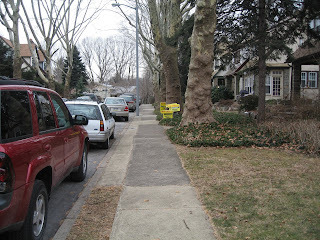 January 18, 2009: Brunch Day! We had our brunch gathering today. 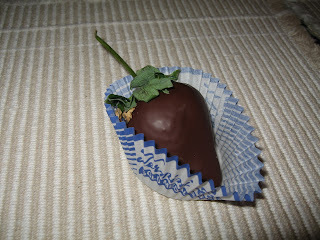 I didn't get a good shot of the group, so instead I'm presenting a lovely chocolate covered strawberry that Stefan brought. Yum. 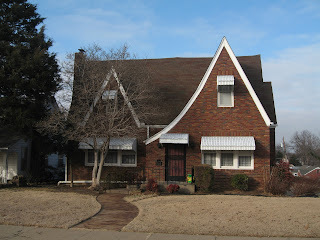 Our neighbors a few doors down recently put their house up for sale. They apparently plan on an open house this Sunday since there are lots of signs in their yard!! January 16, 2009: More Cleaning - Ewww! 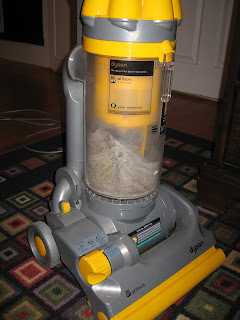 Look at all the grossness in the vacuum cleaner! We continued our cleaning effort in preparation for Sunday's gathering. This morning, we got a group of people together and went out to breakfast before work. We had an enjoyable time and plenty of food! 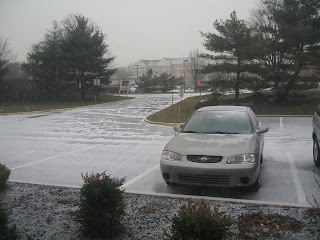 Now it is snowing which is lovely too. 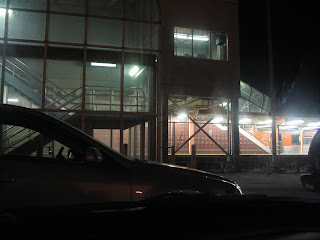 At work, there is construction going on in the neighboring space. 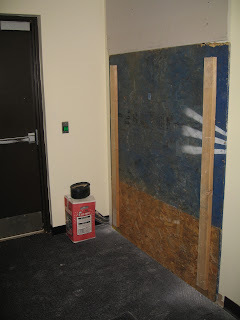 Today they decided to cut a hole in the wall into our office space. Isn't that special? 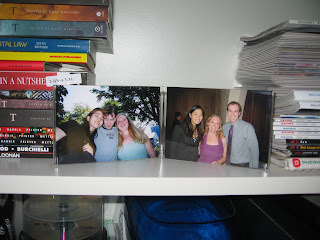 When my mom saw the photo of Yuki, Aria and me from Adair's wedding, she was reminded of this other one so she put them in a frame together. Isn't that nice? Tonight was my second visit to Wegmans for book club! (Should have been the 3rd but ... that didn't work out.) 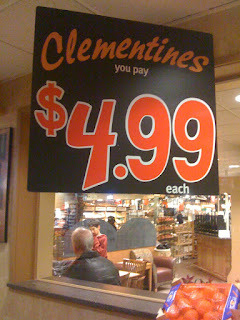 I bought some cheap and tasty clementines too! 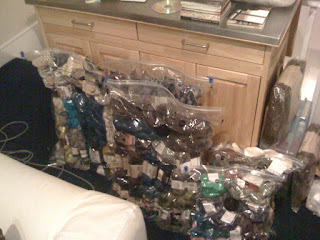 Chad bought Space Bags the other day so he could pack up his yarn. He filled a bunch of bags and sucked out all the air. Look at all this yarn! It's ridiculous. We have guests coming on Sunday, so we decided we better clean the house. 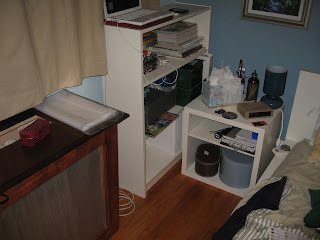 So here is my side of the bed looking tidy. You don't want to see the "before." 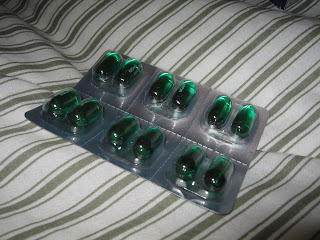 So I really like using NyQuil when I have colds because it puts me right to sleep. We haven't had any all week but today we bought some. Sleep here I come! Okay, so Ruth gave me Advil Cold and Sinus today to help me sleep tonight. It cleared my head, but I ended up forgetting to take a photo! It should have been of the pill. Today I stayed home sick from work because I had a sore throat the past two days. 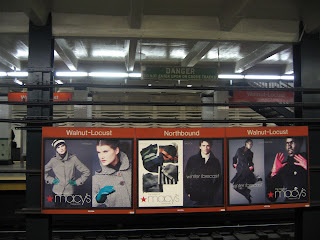 But it was the first night of class, so I took the subway down. It was kind of miserable. 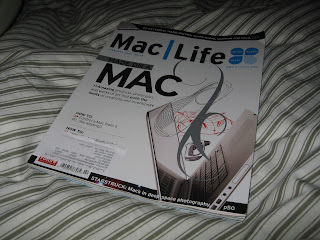 January 6, 2009: Yay Mac Life! Chad gave me a renewal to my Mac Life subscription for my birthday back in October. But they kept sending me "last issue" notices. Finally it looks like it is renewed. Yay. January 5, 2009: Honey is so Cute! Look at Honey licking her lips! 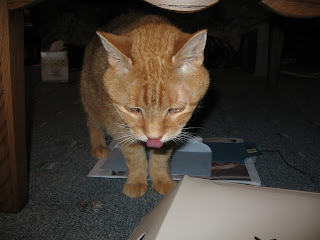 I caught her in the act of licking the sticky part of an envelope. It is so nuts when she does this. I don't quite understand it but she is cute. Chad and I flew home today from Oklahoma. 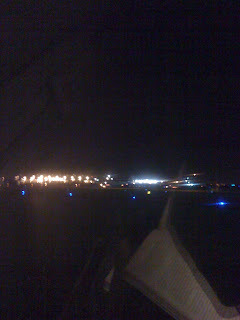 We didn't land until just around midnight. As much as I've traveled, I still hate the process every time. It's good to be home. Chad and I traveled to Bartlesville today! After eating lunch we went to the Finchers' house. 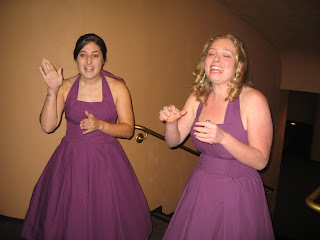 We got to partake in the pre-wedding insanity for a bit! Sorry everyone. I completely forgot to take a photo on the first day of the year! So no photo here for you! Hey, after 2 complete years, I am allowed to slip up a little bit right? Oh well.